For me, the two most fascinating figures of the last century are Richard Nixon and Walt Disney. They shared a surprising amount of similarities in upbringing and even some of their views. In a lot of ways they represent two sides of the American Dream, one using talent and opportunity to enrich the world, the other wasting it on power and corruption. If I have to explain who did what in the previous sentence, then you need to read a lot more about history. There's already been a decent amount of coverage about Nixon's connections to Disney. Still, researching the topic myself, I come across some interesting things. 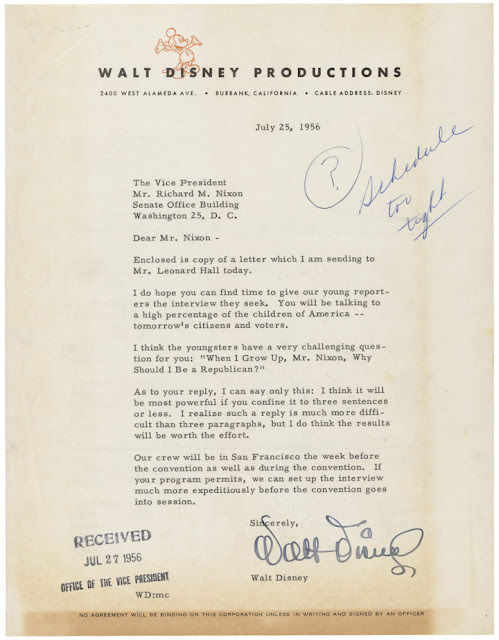 This letter from 1956 personally requests then Vice President Nixon appear on the Micky Mouse Club show to address the question "Why should I be a Republican?" Most likely meant for a segment about the upcoming election, Nixon was unfortunately unable to fit the appearance into this schedule. Apparently it was only a tight schedule that prevented the appearance, as two years later Nixon appeared on an episode of the program. Unfortunately, recordings of the episode or even transcripts of it are not readily available online, but it's safe to assume he probably didn't talk about his dog Checkers or sweat too much in front of the camera. At least, I hope not.